Federal agencies are under considerable pressure to modernize their mission supporting IT infrastructures while containing costs and providing robust security for systems and data. They face imperatives to consolidate and optimize data centers and migrate workloads to the cloud, as well as to support an increasingly mobile workforce eager for easy access to government networks and applications, regardless of their locations or devices. This is a tall order for agencies, but a wide array of technologies — both mature and emerging — can help agencies realize great cost efficiencies, ease of management, high performance, and strong security as they embark on their modernization journeys. 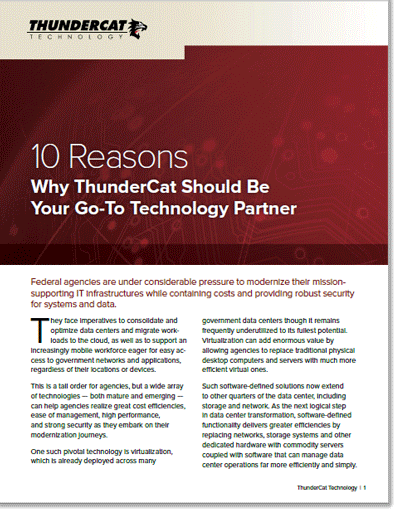 To learn about ThunderCat Technology and VMware, download this free whitepaper.